Einstein’s special relativity has proven more useful than ever, as scientists have now used it to discover an alien planet around another star. The newfound world — nicknamed “Einstein’s planet” by the astronomers who discovered it — is the latest of more than 800 planets known to exist beyond our solar system, and the first to be found through this method. The researchers capitalized on subtle effects predicted by Albert Einstein’s special theory of relativity to find the planet. The first is called the “beaming” effect, and occurs when light from the parent star brightens as its planet tugs it a nudge closer to Earth, and dims as the planet pulls it away. Relativistic effects cause light particles, called photons, to pile up and become focused in the direction of the star’s motion. “This is the first time that this aspect of Einstein’s theory of relativity has been used to discover a planet,” research team member Tsevi Mazeh of Tel Aviv University in Israel said in a statement. 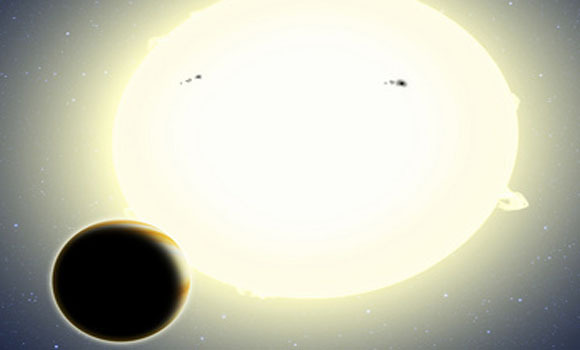 The researchers used data from NASA’s Kepler spacecraft, which provided the extremely detailed observations necessary. While Kepler was designed to hunt for alien planets, it normally does so using the transit method, which looks for stars that dim periodically as planets pass in front of them. “This was only possible because of the exquisite data NASA is collecting with the Kepler spacecraft,” said study leader Simchon Faigler of Tel Aviv University. The other most popular planet-hunting tactic is called the wobble method, and searches for slight signs of movement in stars’ radial velocities caused by tugging planets. The new Einstein-based method is best for larger worlds, and is currently incapable of finding Earth-sized planets, the scientists said. Still, it offers some benefits, as it does not require high-precision measurements of a star’s velocity, or for a star and its planet to align perfectly as viewed from Earth — the two main drawbacks of the most common methods. “Each planet-hunting technique has its strengths and weaknesses. And each novel technique we add to the arsenal allows us to probe planets in new regimes,” said Avi Loeb, also from the Center for Astrophysics.